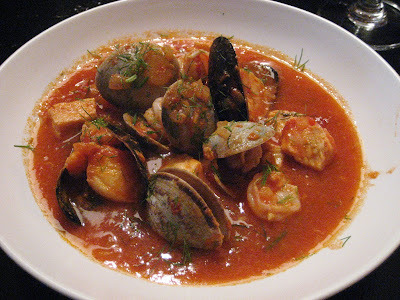 I had never heard of Cioppino until a couple of years ago when I had it at my friend Nan’s house on Christmas Eve. I was a little skeptical about a fish stew, but was pleasantly surprised by the amazing flavor of this dish. It wasn’t fishy at all and the combination of the fennel, white wine, and fish with an underlying tomato flavor was to die for. This was my first time making this and I over-cooked the salmon and halibut a bit, but it was otherwise very yummy. I think I will add some scallops next time too. Heat the oil in a very large pot over medium heat. Add the fennel, onion, shallots, and salt and saute until the onion is translucent, about 10 minutes. Add the garlic and 3/4 teaspoon of red pepper flakes, and saute 2 minutes. Stir in the tomato paste. Add tomatoes with their juices, wine, oyster and chicken stock and bay leaf. Cover and bring to a simmer. Reduce the heat to medium-low. Cover and simmer until the flavors blend, about 30 minutes. Add the clams and mussels to the cooking liquid. Cover and cook until the clams and mussels begin to open, about 5 minutes. Add the shrimp and fish. Simmer gently until the fish and shrimp are just cooked through, and the clams are completely open, stirring gently, about 5 minutes longer (discard any clams and mussels that do not open). Remove bay leaf. Season the soup, to taste, with more salt and red pepper flakes. Because oyster stock isn't that easy to come by, you can try this with bottled clam juice, too. Cioppino is one of my favorite soups.